PDH LIBRARY - Online Engineering Continuing Education for Engineers since 2009! PDHLibrary offers engineering continuing education for licensed professional engineers. We offer courses in ethics, laws, rules, as well as discipline specific engineering courses in the fields of civil, electrical, environmental, mechanical, structural, and transportation engineering. 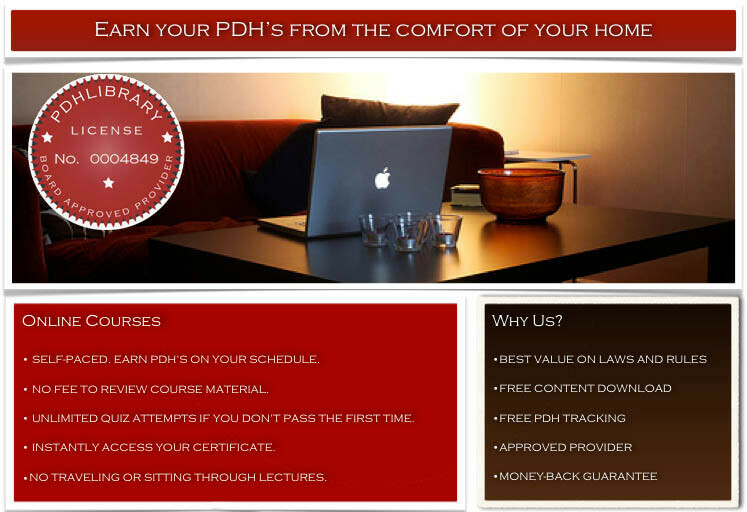 As noted above, the benefits of online PDH continuing education are numerous including lower prices, convenience, self paced course completion, and certificates of completions which are archived and available 24/7. Let us know how we are doing and what we can do better. We want to make sure using PDHLibrary to fulfill your professional development hour (PDH) needs is easy, convenient, and satisfying. 1) Create New Account: Register with our website by clicking on the "Create new account" link (found in the lower left hand corner) or log into your account if you already have one. 2) Download Course Materials: Navigate to the course description page of your choosing. On the right hand side of each course description page is a download button that you can use to download the course materials to your computer. Read the course materials. 3) Take Quiz: Log into your account. Then click on the quiz button on the right hand side of the course description page to take the quiz. Take the quiz as many times as necessary in order to pass with a 70% or better. You may start the quiz, stop, and then return to the quiz at a later time to finish. 4) Pay for Course: When you pass the quiz, a green checkout link will be provided for course payment via credit card processing thru PayPal's secure servers. ALTERNATIVELY you can also pay for the course at any time by adding the course to your checkout cart. You can purchase the course either before or after the quiz. The order does not matter. You pick! 5) View Certificate of Completion: To view your certificates of completion or to review your course history, click on "My account" followed by clicking on the "Courses Taken" tab. You must be logged in your account to review your course history. Online Engineering Continuing Education since 2009! PDHLibrary offers online engineering continuing education Courses for licensed professional engineers. We offer courses in ethics, laws, rules, as well as discipline specific engineering courses in the fields of civil, electrical, environmental, mechanical, structural, and transportation engineering. 1) Create New Account: Register with our website by clicking on "user login" above and then the "Create new account" link or log into your account if you already have one. 2) Download Course Materials: Navigate to the course description page of your choosing. At the bottom of each description pages is the course download button that you can use to download the course materials to your computer. Read the course materials. 3) Take Quiz: Log into your account. Then click on the quiz button found at the bottom of the course description page to take the quiz. Take the quiz as many times as necessary in order to pass with a 70% or better. You may start the quiz, stop, and then return to the quiz at a later time to finish. 4) Pay for Course: When you pass the quiz, a green checkout link will be provided for course payment via credit card processing thru PayPal's secure servers. ALTERNATIVELY you can also pay for the course at any time by adding the course to your checkout cart found at the bottom of each course description page.